I’ve never had to deal with them. I don’t know what they talk about. I ignore what they like. In meetings, all countries are usually present but them. I have received emails from colleagues of all nationalities but them. There are a lot of them but you never see them in restaurants, in bars at the swimming pool, playing darts, shuffling cards. Where you see them is in the street or on the roads, always going from one place to another, manoeuvring diggers, giving orders to Liberian workers, shouting, raising their hands and lifting fingers to give new instructions. Some of them go jogging in the street as though they are running on a pavement that only they can see. This is how the Chinese are in Liberia (all over the world), they tend to look towards a horizon that nobody else can see, an ocean that only they can understand. I write these words from Monrovia, in front of the Atlantic Ocean. It is funny, I suppose: I recall typing at a keyboard faced by walls, surrounded by walls. In fact, I don’t recall having ever written in front of the sea. And at the moment I have the sensation that the sea distracts me, that it is noisy and that the sea makes me forget as well as recall. I don’t find it comfortable writing here. Not because I am doing so in a foreign house and terrace in this compound on UN Drive, but because of the uncomfortable plastic chair in which I am sitting, as well as the unpleasant plastic table where the laptop sits and tries to seem real at the same time that dust aims to get its particles inside. Meanwhile, I have unspeakable difficulty in resting my back against the chair when I write. I can’t lean on the arm of the chair either as I am sweating now. Marvellous, the sea, marvellous the Atlantic Ocean. So, I think about China and the Chinese who live and work in Liberia in an imperceptible way. I think about the Chinese who see us without being seen. I think about the Chinese who as far as I know I have never even exchanged a single word with in Liberia. Nonetheless, I see the Chinese everywhere. I see the schools that they build, the bridges they put up, the faculties they erect, the roads that they tarmac, the hospitals they open, the harbours they inaugurate, the train tracks they ride on. And yet, I don’t see them. I can’t talk to them even though I hear them. In fact, I’ve only heard them once, one night. It happened in a hotel in Freetown, in Sierra Leone. For the first time I heard them. I had arrived at a Chinese hotel since it was cheap and it also offered views of Lumley Beach. In this hotel, whose name I have forgotten, there was a Chinese chief receptionist who was supposed to handle the money, the bookings and all of those things you should take care of in a hotel. She had a certain something. I don’t think she had seen me in the entire three days that I spent there. Strangely enough it was I who reminded her that I needed to pay the bill on the final day. She agreed indifferently, pushed various buttons on a huge calculator and, of course, she showed me the amount I owed without even saying a word. Those who spoke were Africans, the Sierra Leoneans hired by the Chinese who carried the bags, cleaned the rooms and helped in the kitchen. With them I exchanged jokes and gags, but I only knew that the Chinese were alive one night. A normal night in which I was awoken by them, not shouting but talking in a very loud voice that must be normal for them… ”So the Chinese do talk, after all”, I said, “and indeed very loudly”. It was the first and only time I interacted with them. I furiously opened the door and said a few things loudly, angrily. What I was expecting was a rude, dry reaction, taking into account that I was clearly outnumbered, but it turned out to be a reaction of surprising submission: they all nodded at the same time by way of an apology. Such apologies that tend to occur, which, as to be expected, don’t mean anything since in a matter of minutes they continued the uproar. On one of my outraged exits from my room to ask them to be quiet, I recall that my attention was drawn to Chinese man smoking a lot opposite a Sierra Leonean with whom he talked with complicity – which grabbed my attention. It turns out that the Chinese do talk. And until that moment in the Chinese hotel in Freetown, my contact with the Chinese community had been the most surrealistic. Once, close to Somalia Drive in Monrovia, the driver at my work lowered the window to ask for directions to the first car that would drive past and it turned out that it was a Chinese guy. All he could manage was “ooh, man…” and he hit the accelerator to get rid of us as quickly as he could. Once, on the terrace at Golden Beach a group of three Chinese guys sat down and one of them even turned around to check out one of the girls in my group. They were three slim Chinese guys, with spiky hair, red Polo shirts and prominent Adam’s apples jammed in their throats. They looked around a little untrusting, as if they were looking out from an invisible, but present, glass cage. On another occasion in a hotel in Accra, Ghana, a Chinese guy appeared on the terrace of a crowded restaurant. With an almost frozen expression, he crossed the terrace and sat alone in a corner with his back to everyone. With his back to everyone. In the meantime I still don’t quite get the Chinese. What I do see are the schools that they build, the bridges they put up, the faculties they erect, the roads that they tarmac, the hospitals they open, the harbours they inaugurate, the train tracks they ride on. The conquest of Liberia and Africa with anaesthesia. Without the need to integrate, without the need to report on their earnings or their activities. On and on in silence. It will be hard for me to write in front of the sea again. 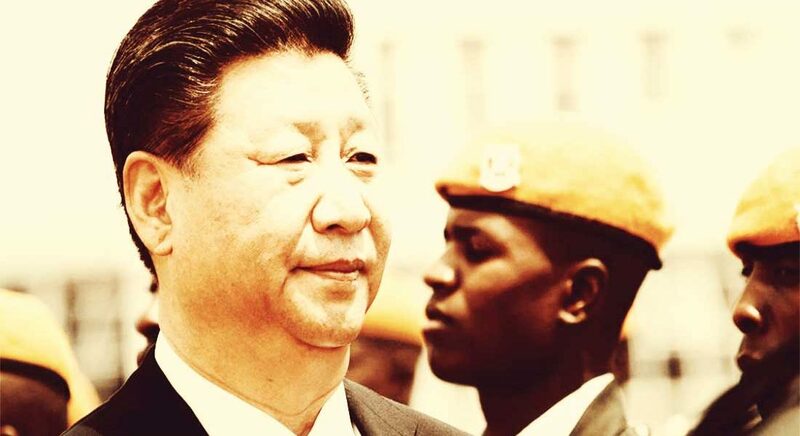 This is a fascinating article that explains the actuality of the Chinese activities in Liberia. Worth reading again!